Zimbabwe is one of the most desirable places in Africa to go on vacation or safari, thanks to world-class attractions like Hwange National Park, Lake Kariba and Victoria Falls. And with many splendid lodges dotted around the country, there’s no shortage to places to stay; in fact, there are enough noteworthy lodges to fill several articles. But here we’ve narrowed it down to some of our favorites. Here are 10 elegant lodges in Zimbabwe that we love. This lodge is located right on the edge of a cliff overlooking a river in Gonarezhou, which is ideal for birding and venturing off on safari. The view of the gorge itself isn’t too bad either. Rooms at the lodge are quite luxurious, and come with a private balcony to unwind after a long day of spotting wildlife. If that wasn’t enough, you can watch elephants, hippos and crocodiles in the river from the fantastic viewing deck. If you’re staying near Victoria Falls, it would be hard to do better than this impressive thatch masterpiece. The safari lodge is set in a beautiful area overlooking a watering hole and a landscape of trees with animals like warthogs grazing around the grounds. There are two floors on the property and each room has fantastic views of Zambezi National Park, where you can easily spot kudu, elephant, buffalo, impala and more. Situated on a 6,000 acre area next to Hwange National Park, this intimate bush lodge specializes in giving guests the opportunity to relax and get up close with elephants. In fact, there are dozens of herds of them that roam around the watering hole in front of the lodge. As for the lodge itself, it features nine chalets at the ground level, along with several elevated tree houses, so you can get as close as you want to nature. The Ivory Lodge also offers a fantastic hide by the watering hole where elephants are so close they can touch you with their trunks. This property is owned by the same luxury group that runs the Victoria Falls Hotel and is located in a private reserve adjacent to the park. While it isn’t as luxurious as the property in Vic Falls, it still has a homey feel, a modern main lodge, and a swimming pool facing a watering hole where you can spot animals walking about while relaxing. This lodge might just have the best views of any on our list and overlooks the gorgeous Lake Kariba and has recently reopened in 2017 under new ownership of African Bush Camps. Guests at the lodge can enjoy comfy safari-themed rooms, delicious dining, relaxing spa sessions, evenings by the fireplace, or swimming in an infinity pool that overlooks the giant lake. Of course, as with most hotels in a location like this, there are plenty of activities to participate in, such as game drives, guided walks, boat cruises, fishing excursions and more. Not to be confused with the Victoria Falls Safari Lodge, though it is on the same grounds, the Victoria Falls Safari Club is just as posh and features only 20 intimate rooms. The bedrooms here are super modern and feature beds in front of windows where you can watch animals in comfort. Note that this property does not allow children under 10 years old and is more suited for couples on a romantic getaway. Located in the Malilangwe Wildlife Reserve, this luxury eco lodge is one of the finest in the country and helps to foster the sustainability of the nature and wildlife in the area. Unfortunately, it’s currently closed for renovations but will be re-opening again in Mid May of 2018. Former visitors and people who haven’t been here before will want to go to see the new updates. Tucked into the suburbs of Harare, this fancy property has a posh five-star vibe and an air of exclusivity, as it only has 16 rooms and suites. 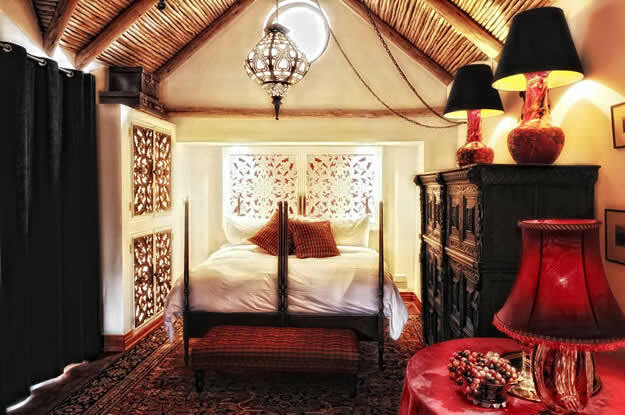 Each room has a separate boma-like environment with manicured gardens and a safari style atmosphere. You’ll also find lush gardens on site, which are filled with native plants and flowers — the perfect place to stretch one’s legs and relax. The self-catering, thatched-roof bungalows at this lodge make it a perfect fit for families heading to Victoria Falls. It’s also located on an unfenced section of Zambezi National Park, where you can watch animals grazing among the baobab trees. While the bungalows here are somewhat basic, the lodge has nice amenities like a full kitchen and a shuttle bus that goes to the falls frequently. Located in one of Hwange National Park’s prime wildlife areas, this safari camp puts guests right in the middle of herds of hundreds of elephants and buffalo for an experience like no other. The safari lodge offers options of sleeping in a tent, a safari house, or a tree house, giving guests several ways to enjoy their vacation. While there are safari drives available, guests don’t even need to leave to see animals like elephant, giraffe, zebra and kudu wandering through the grounds. Joe Kennedy is the editor of AFKTravel.com.